MSRP (CAD): $52.63 *** Please contact us for corporate pricing or login to see web pricing or US$ pricing. It's no surprise that Fargo offers some of the most intelligently-designed card printer ribbons around; after all, Fargo brings more than 30 years of experience to the design of their products, which are used by thousands upon thousands of government, corporate and public organizations worldwide. In creating the 44205 Monochrome Custom Resin Red Ribbon, Fargo's engineers have elevated ribbon design to a new level of artistic achievement. With every card you print, you'll witness the creation of a card that offers the sharpest images, text and barcodes around. And because Fargo ribbons are precision engineered with RibbonTraq technology for seamless integration with Fargo DTC Printers, correct ribbon installation is simple, and wasted cards are unheard of. At 1000 prints per ribbon and a built-in cleaning roller, the Fargo 44205 outperforms other ribbons at a price even lesser ribbons can't touch. These highly specialized 44205 print ribbons are the best way to ensure that your DTC 300 card printer/encoder functions at its optimal best. 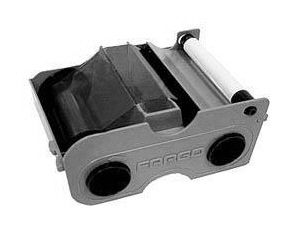 To protect your print head and other valuable printer parts, and for maximum card durability and quality, use only Fargo Certified Supplies in your Fargo DTC 300 card printer.